Children's music is really taking off thanks to Stinky Ninja's album Musical Style Adventures. Twelve songs covering the evolution of modern music from fully acoustic Folk music through to fully electronic Hip-Hop. Each song features a skilled vocalist and is accompanied by award winning musicians. 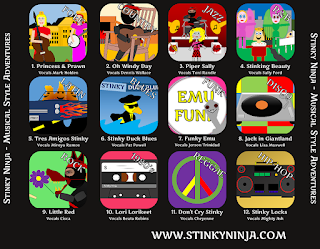 Children can learn more about music on Stinky Ninja's website www.stinkyninja.com which contains information about each song and each artist.